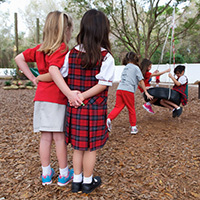 Carrollwood Day School welcomes all prospective applicants and families. The school seeks to admit those students who show the potential to grow significantly while at CDS. Students must be academically on or above grade level. Students who require specialized instruction or are unable to function adequately in the classroom are not considered for admission. Each division – Lower School (Early Childhood and Elementary), Middle and Upper School – has slightly different admissions procedures, so please visit the page for the division in which you are interested. Regardless of the age of the student, Carrollwood Day School strongly recommends a personal tour for the parents prior to submitting an application. Families will receive an admissions packet during their visit. The application can be completed and mailed back. Beginning in kindergarten, all applicants are required to meet with a member of the CDS admissions team to complete a developmental/learning assessment. After the application has been submitted, an optional half-day visit for MS and HS applicants in their current grade can also be arranged. Experiencing our learning environment first hand is a key component in the school selection process. Tour school. Contact Admissions office to schedule; at conclusion of visit family will be given a code to submit an online application to the ECC. Click here to submit online payment of $75 application fee. For PreK-4 applicants, the Admissions Office will contact you to schedule an appointment to meet with the Assistant Head of the ECC to complete a developmental assessment. Tour school. Contact Admissions office to schedule (813.920.2288); at conclusion of visit family will be given a code to submit an online application to the ECC. The Admissions Office will contact you to schedule an appointment for the applicant to meet with the Assistant Head of the ECC to complete a developmental assessment. Once your application has been submitted you will receive an email to schedule the learning assessment. Submit Student Evaluation form from applicant’s current teacher. All students in grades 4 and 5 are required to have a personally owned iPad. Once your application has been submitted you will receive an email to schedule a shadow date. All middle school applicants: Register to take the SSAT and have results forwarded to CDS. You can register online at www.ssat.org. Please be sure to designate Carrollwood Day School (code #2137) on the test form. Please click HERE to see technology requirements for grades 6-8. Submit Student Evaluation form from 2 of applicant’s current teachers (Math and English). Download Transcript Release form and give to the records office at applicant’s current school. 9th grade applicants only: Register to take the SSAT and have results forwarded to CDS. You can register online at www.ssat.org. Please be sure to designate Carrollwood Day School (code #2137) on the test form. Please click HERE to see technology requirements for grades 9-11.